Hulu has finally begun its long awaited international expansion, opening the doors on a subscription only service in Japan. Hulu Japan is offering programming from NBCu, CBS, Sony, Twentieth Century Fox, Disney/ABC and other partners and costs 1,480 yen ($19.20) per month. Unlike it’s US subscription service, locals get the offering ad free. “Today, we are taking a first but important step to make good on our aspiration to serve customers all over the world,” said Johannes Larcher, SVP of international with Hulu. The payment gives subscribers access to the full range of Hulu content through multiple devices including internet enabled TV’s, consoles and smart phones, on top of its standard web offering. The company has entered into a mobile marketing agreement with NTT Docomo, Japan’s largest mobile network. 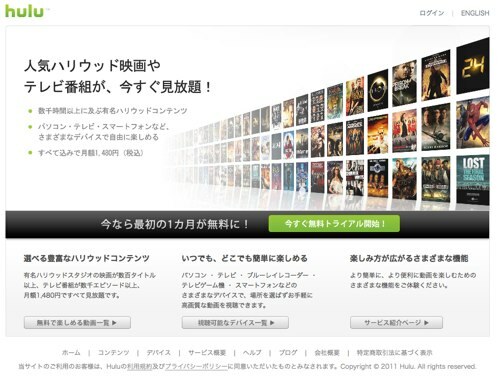 One thing Hulu Japan is lacking at launch is local Japanese content, although Hulu promises local content “will be added” at an unspecified future date. Ad free content sounds fantastic – considering you ARE paying for it in the first place. Though I am hanging for decent content providers to finally make their way to Australian shores. Bigpond Movies can go die in a fire. Hopefully the move to Japan is just the start.